The Mercedes-Benz 300 SL was based on a race car of the same name. The tubular space frame was a fundamental engineering achievement that it shared with its competitive cousin. This lightweight yet overall strong chassis enabled much of the advanced suspension and drive train breakthroughs to be realised which led to the 300 being king of the track. The 300 SL Roadster has a modified space frame that adds more boot space and, of course, supports the doors. 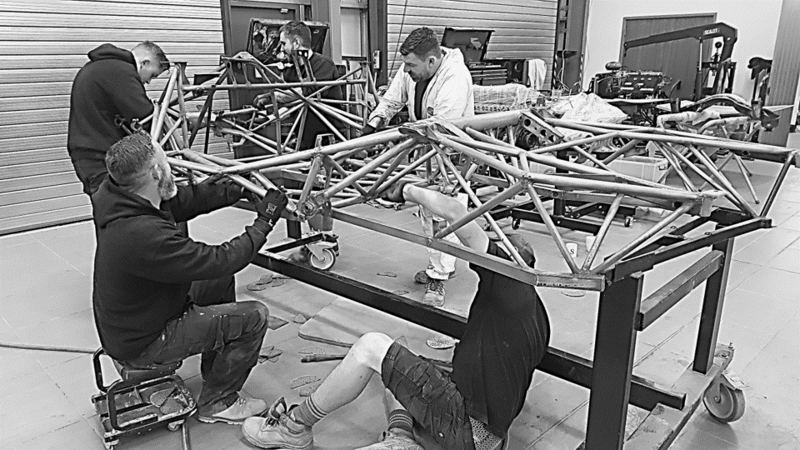 With the body removed and the suspension and running gear components removed, the first step for the restoration of the space frame is to strip the old paint then powder coat the bare metal. However, bare metal attracts rust which is why there are 6 Hemmels craftsmen (look closely) urgently completing the fine preparations prior to powder coating.